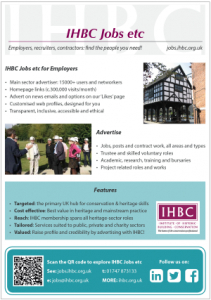 Helping conservation careers and heritage employers across the UK, the IHBC updates readers about recent job and trainee openings on its ‘Jobs etc’ service – from HES (Historic Environment Scotland) to HRP (Historic Royal Palaces) – so sign up for free alerts today to stay ‘in the know’ on IHBC’s ‘Jobs etc’! ‘A special recent highlight in early career opportunities has been the advertisement of 10 trainee posts at Historic Environment Scotland (HES), with salaries from £17,500 – which represents a substantial investment in the full diversity of skills across built and historic environment conservation practice – while heritage-linked roles for suitably qualified professionals in Quantity Surveying (QS) and Project Management (PM) – with salaries ranging from £30k- 70k and £30k-60k respectively – are on offer at Historic Royal Palaces (HRP). ‘Other posts advertised embrace an equally diverse spread of local authority conservation-specific posts, such as at Thanet and the Peak District National Park, as well as Wokingham’s Urban Design and Conservation Officer post and, previously noted, Chichester’s Conservation and Design role. The charity sector service provider South West Heritage Trust also is seeking a Senior Conservation Officer to operate in a comparable role. Altogether these reaffirm the role and core skills that the IHBC invests so much effort in supporting. The private and linked sectors are also busy searching for the conservation skills offered by IHBC members and member interests, at all skills levels. Turleys and Cotswold Archaeology seek generally skilled specialists, as Heritage Professional and Historic Building or Area Consultant respectively, while Jane Jones-Warner Associates seeks an architect, architectural technologist or similar. More tangential conservation related toles are also prominent this round, with heritage project management-related work especially well represented even beyond those at HRP as mentioned above. Swindon HAZ and Perth and Kinross Heritage Trust (with 2 separate posts) seek project linked skills sets, as does (still) the Cleveland Pools Trust and, in an even less familiar role, Between Time Ltd, which seeks a ‘Conservation Contract Manager’. 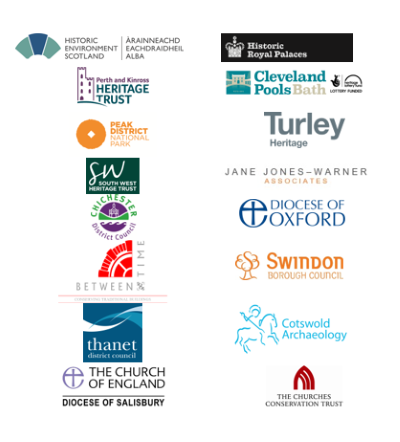 Church-linked employers also offer real opportunities for members to develop, refine and extend skills , with the Diocese of Oxford seeking an Assistant Church Buildings Officer; the Churches Conservation Trust an Estate Officer, and the Diocese of Salisbury a part-time DAC Secretary. ‘So if you are seeking a post with heritage-related skills, or just want to keep up to speed on what is out the and what people are being paid these days, be sure to sign up to our free Jobs etc alerts’. IHBC Jobs etc service reaches a uniquely diverse heritage network of practitioners and advisers from different specialist backgrounds, including architects, planners, engineers, archaeologists, historians, builders, contractors, academics and many more!